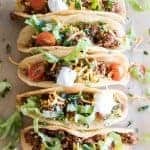 Slow Cooker (affiliate link) Steak Fajita Taquitos recipe. 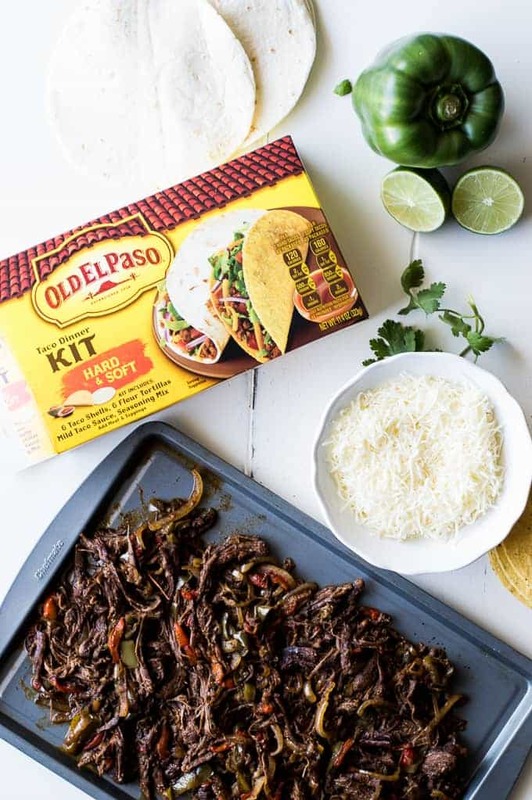 Flavorful fajita meat cooked in the slow cooker (affiliate link) with peppers and onions then loaded into soft flour tortillas with cheese and baked! 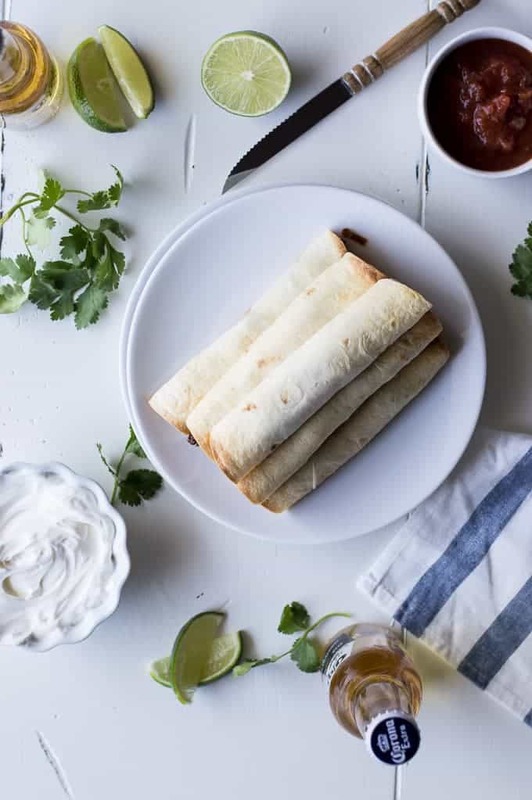 These taquitos are snacking perfection! 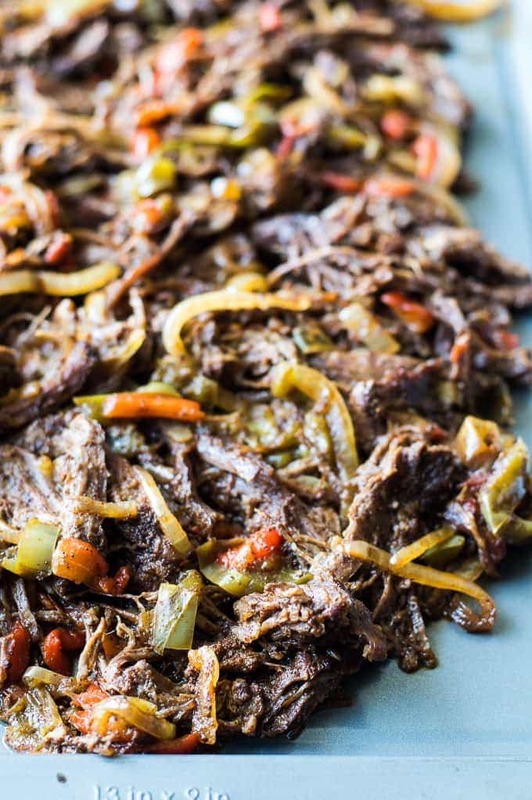 Time to get the slow cooker (affiliate link) in the action for game day! 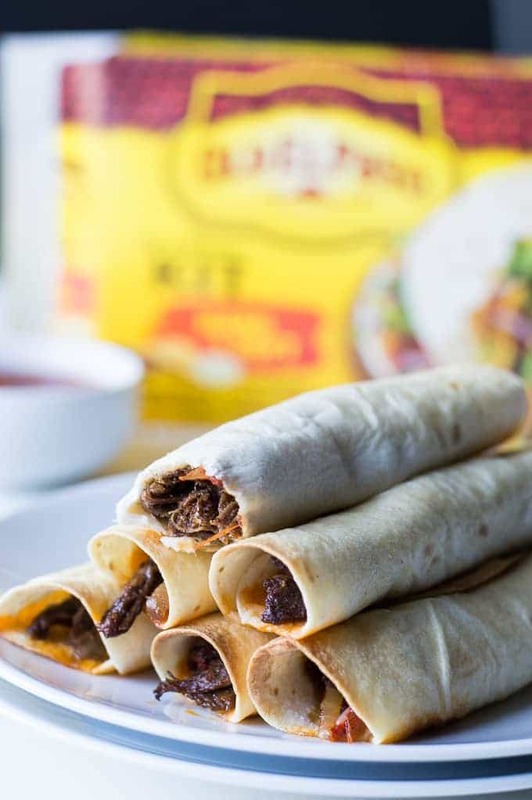 These steak fajita taquitos are definitely easy and the best way to spice up game day. Not to mention flavorful, cheesy, and perfectly portable and made for dipping! It’s football season, of course, which means games and get togethers and food. We’ve discussed this before remember, I’m pretty sure..? So, there’s some things I’ve learned about living in Texas and getting together with friends. There’s always queso. And there’s always bomb Tex Mex snacks. So I had to cook up my own Tex Mex snack to be prepared when it’s time for the Big Game. And I don’t think it gets any more Texan than fajitas. On another note, taquitos or flautas. Sigh. Do you know the difference? 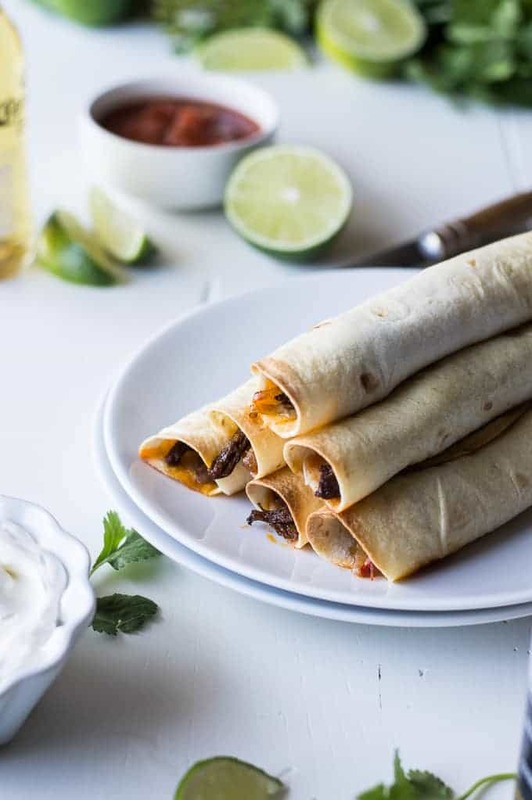 I chose to make these with flour tortillas, which would lead one to think these should be called flautas. But these are also more of an appetizer and a smaller size, which leans more towards taquitos. So what is one to do? What should I call these? The hubs said I should call them Flaquitos. But then, no one would know what I’m talking about. So I’m going with taquitos and basing that more on the size of these and the fact that they are an appetizer snack size than a meal size. Moving on, now that I’ve probably confused you with my talk of flautas and taquitos. These are absolutely the perfect snack! 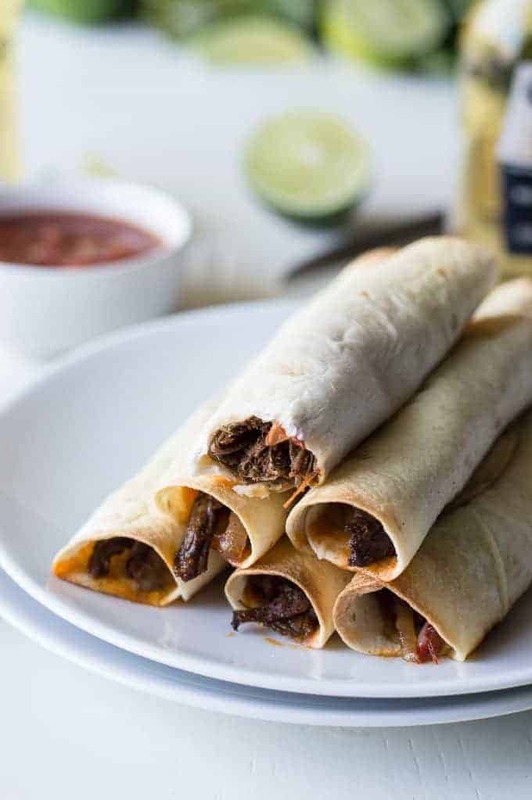 Fajita meat, bell peppers, onion, cheese all rolled up in flour tortillas. Let’s take a moment and discuss these tortillas. I got these at our local Tom Thumb, where they happen to have a whole aisle of Mexican food and half of the aisle is Old El Paso™ products. These are actually Old El Paso flour tortillas which are my favorite for making into taquitos. For one, their size. Not too big, not too small. And they roll so perfectly and hold their shape! When you go to bake them make sure that you are placing them seam side down. I have had no issues with them unrolling or opening up prior to baking. Seriously, I love these tortillas. 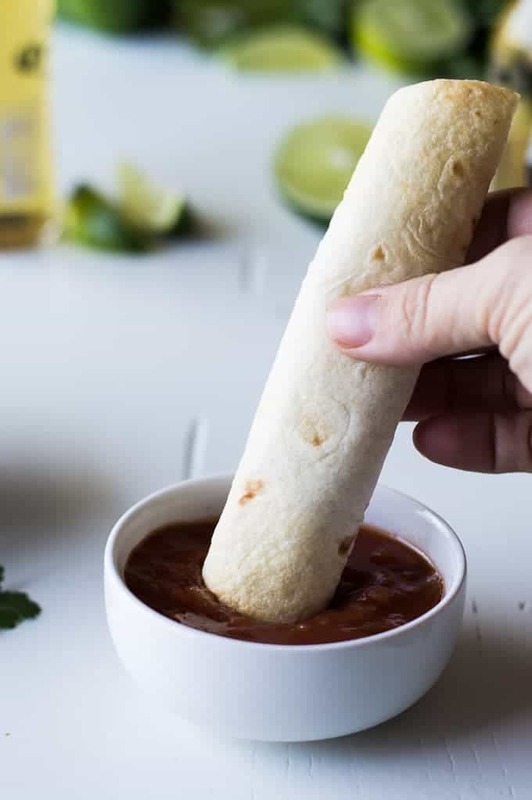 For snacking I believe that having some salsa or sour cream on hand is a must for taquitos. Some kind of dipping needs to take place. In a small bowl combine the spices and stir to mix together. Set aside. Slice the peppers and onions into long thin strips and set aside. Rub the flank steak with the dry rub (spices) coat both sides. 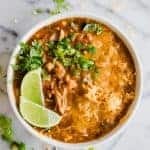 Place in the slow cooker (affiliate link). Top with the sliced peppers and onions. 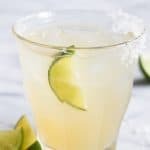 Pour lime juice over the top. Cook over high heat for 4 hours or low heat 6-8 hours. Once the meat is fully cooked, shred the steak using two forks. Stir to combine the shredded meat with the cooked onions and peppers. Cover a baking sheet with foil and spray with baking spray. Set aside. Spoon the fajita mixture onto a tortilla and top with cheese. Roll tightly and set onto baking sheet with the seam side down. Continue until all fajita mixture has been used. Will make about 12 taquitos. Spray the taquitos with a butter baking spray or brush with melted butter. Bake for about 10 minutes or until tortilla is just turning golden brown. Remove from oven and allow to cool for about 2 minutes. Serve warm and enjoy!